Our Rigid Inflatable Boat Insurance is a good quality boat insurance product at a highly competitive rate, it's that simple. We purposely keep our business overheads low to provide you with the best deals, it really is that simple. Resulting in complete confidence that our policies are second to none for a combination of quality and cost. Furthermore at Mercia Marine we can guarantee you UK based customer service from named advisers, something you can always expect when dealing with us! Details of our other RIB insurance policy benefits are below. Don't compromise! 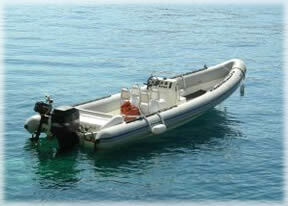 Great rates on all RIB Insurance policies guaranteed. Up to 30% no claims discount can also be protected upon request. Trailer, trolley and outboard cover available as required. Free water-skiing, wake-boarding & water-toys insurance. UK only staff, no automated calls & never any junk mail! Here are a few pieces of feedback we've had from RIB owners such as yourself. Hopefully this helps satisfy you about the quality of our service offering. RIB's are one of our specialist areas in which we know we're highly competitive, we can cater for absolutely any type of RIB and make certain on a like for like basis our quotations always provide great value. Why pay more for less? Get covered today!